Families in business that aspire to sustain their enterprises across generations need to find ways to perpetuate their entrepreneurial orientation. Families variously endeavor to develop entrepreneurial mindsets across generations and this typically entails story-telling and recounting heritage values to inspire later generations to enterprise. Those stories that relate to entrepreneurial behaviors have been referred to as entrepreneurial legacies. These legacies have been found to not only motivate incumbent and next-generation owners to engage in strategic activities that foster transgenerational entrepreneurship but also to embody resilience as persistence in the face of risk. Considering the well-known growth and survival challenges that family businesses face, this concept of transgenerational entrepreneurship on a family level to promote continuity and longevity on a business level has received considerable recent attention. These recent advances are encouraging and help explain how entrepreneurial legacies can influence the entrepreneurial mindsets and actions of business families. But to date only one generational dyad (always adjacent generations) has been used to explore entrepreneurial legacies and transgenerational entrepreneurship. This does not account for the various inter- and intragenerational modes in which the legacy can be transmitted, and thus presents entrepreneurial legacies as static across generations. In this exploratory study Barbera, Stamm, and DeWitt enhance our understanding of entrepreneurial legacies by taking a more fine-grained, dynamic narrative analysis within and across three generations of a single business family, the Kiolbassa family. The family explicitly presents itself in the public sphere as being entrepreneurial and have owned and operated the Kiolbassa Provision Company, a Texas-based sausage-manufacturing company, since 1949. The authors rely upon symbolic interactionist traditions to conceptualize narratives as structures that give coherence and meaning to everyday life of the Kiolbassa family. Within the context of the framework of the Successful Transgenerational Entrepreneurship Practices (STEP) Project 12 interviews were recorded and transcribed as the basis for narratives across three generations of the family. The exploratory study addressed three questions concerning how entrepreneurial legacies are shaped, reshaped, and relate to transgenerational entrepreneurship. In short what the researchers find is that that not all legacy stories are the same. Instead they observe a broad continuum of legacy stories, extending from highly stable, to relatively stable, to relatively fluid, to highly fluid. They elaborate two of these. Specific Kiolbassa family examples are presented to illustrate relatively stable entrepreneurial legacies. Again, specific Kiolbassa family examples are presented to illustrate relatively fluid entrepreneurial legacies. Barbera et. al., then propose that the dynamic characteristics of these entrepreneurial legacies stories are fundamentally connected to each generation’s anticipated future that provide a perspective through which meaning is derived. Such visions are the essence of transgenerational entrepreneurship and reveal the motivation and purpose that are inextricably linked to the structure and development of entrepreneurial legacies. Specifically, next generations are not limited to either escaping or imitating the past. Instead, each new generation can deliberately propose entrepreneurial activities that put forth an anticipated future of their own. Though these proposed activities may be challenged, it appears that as long as the next generation ties their vision to the business family’s entrepreneurial legacy, they stand a better chance of inspiring and sustaining transgenerational entrepreneurship for many more generations to come. Akin to sense-making and sense-giving processes, anticipated futures may also emerge from past legacy stories, but they require adjustments to the narrated past as they underpin a vision for current and future entrepreneurial endeavors. The researchers make a worthwhile contribution to our understanding of transgenerational entrepreneurship. In broad terms, they reinforce the advice to families to invest in communication across generations, especially if they are interested in sustaining their enterprise over the long term. Such cross generational conversations not only develop legacies but also instil values and consolidate the social capital needed to build consensus and shared visions. While somewhat light on implications the paper is of special interest to next-generation family members. The findings highlight how next generations are not limited to either escaping or imitating the past. Instead, each new generation can deliberately propose entrepreneurial activities that put forth an anticipated future of their own. Though these proposed activities may be challenged, it appears that provided the next generation ties their vision to the business family’s entrepreneurial legacy, they stand a better chance of inspiring and sustaining transgenerational entrepreneurship for many more generations. Ken Moores is an FFI Fellow and recipient of the 2015 Hollander Award. He is principal in Moores Family Enterprise in Australia and an emeritus professor at Bond University. Ken can be reached at [email protected]. 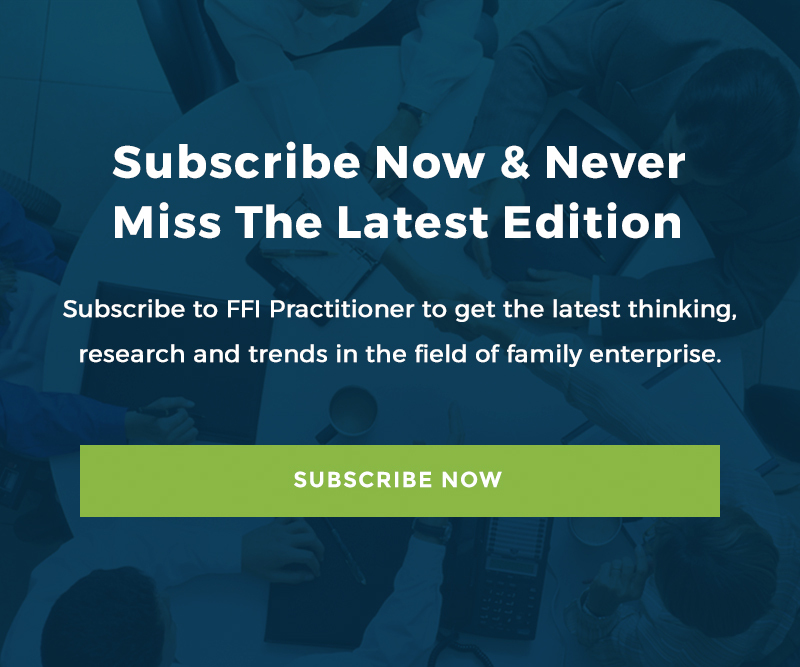 Australia-based Moores Family Enterprise delivers knowledge-based practical advice to families in business to enhance their prospects of continuity through distinctive and empathetic support processes based on communication, education and collaboration.